In first place, for the second time in a row, with 148 Points, is Prometeus! Salvatore wishes to thank everyone who voted for Prometeus and to show his appreciation has sent us a special offer. After narrowly missing out on the second spot in our Q3 poll… this time in second place, with 138 points, is BuyVM! Whilst no coupon, BuyVM have stocked some of their sought-after 128MB plans for us. Last but not least, in third place with 99 points, is Ramnode! This is the first time Ramnode have appeared in our Top 3 poll but they did come fourth in our previous poll. As mentioned above, Prometeus came first in our last poll and they also came second in the Top Providers Q2 Poll, narrowly beating Hostigation by a point. Prometeus were founded in 1997 and have featured five times on LowEndBox since April 2012 providing Xen, OpenVZ and KVM services from their cage in Milan, Italy. They’re also very active within the community. One thing that I reported last time they won was that there didn’t seem to be any negative comments or reviews regarding Prometeus – I am happy to report this still seems to be the case. When casting his vote for Prometeus, ‘Voss’ commented “I felt that Salvatore [the owner of prometeus] actually valued me as a customer“. Another user ‘zsero’ remarked “best VPS in Europe for SSD + for custom solutions” and finally ‘Wunderbear’ said “The total package (network/support/performance) is great and always great deals“. Having a KVM with Prometeus myself, I can only agree that they provide an astounding service. BuyVM are one of the largest LowEndBox providers and have, somehow, managed to appear in every previous Top Providers poll – even winning twice. They provide services from both Buffalo, New York & San Jose, California – however, due to ongoing issues with their providers network, San Jose servers will be relocated to Las Vegas, Nevada. Their servers will be transported from San Jose on the 19th January and will be reconnected on the 20th January. “Always quick to respond to problems, routine upgrades to their equipment, excellent price:performance ratio” – these were ‘NickM’s’ reasons for voting for BuyVM. ‘Kris’ commented “First time I’ve trusted a VPS company with production sites, and feel I can go to sleep at night“. Newcomers Ramnode, an offshoot of a gaming server company, were first featured in September 2012 but quickly made their mark by finishing fourth in our Top Provider 2012 Q3 Poll. When user ‘Imagine’ submitted his three favourite, his comments on Ramnode were “Amazing performance, and friendly service, couldn’t ask for more“. On behalf of all our readers, I would just like to congratulate our top 3 hosts. I believe Hostigation deserves a mention as they came fourth with a very respectable 91 Points – not too far off the ‘medal table’. In comparison, EDIS finished fifth with still a relatively high 54! The final point table will hopefully be published tonight over on LowEndTalk, this thread will be updated once we’ve posted them. I’ve tried all of them at one point, and they all deserve this! Good luck in the future you guys! Congrats and nice job, Liam! Thank you all that voted for us ! Your nice words and appreciations are warmly felt over here ! It certainly makes up for all the abusers, thieves, spammers, fakers, DDoSers that we have to put up with every day. Congrats to Prometeus, RamNode, & Hostigation! Is the promo over at prometeus? The direct link takes me to a more expensive package with no indication of what specs a KVMSSD5 is. As a customer of both BuyVM and RamNode, I can see why they are so highly-regarded. Keep up the excellent jobs you both do! Well done winners. You certainly set the standard for leb hosting! prometeus kvmssd5 € 37.5 /year | ($48~),~~~~(>_<)~~~~ ,i bought it for 45€/year .but the prometeus is really nice ! vote for RamNode of them, great services ! Thank you so much LEB/LET admin team for working really hard on this. Congrats to the winners! Specially Uncle Sal and Boss Fran. Your service rocks! Lots of votes it seems? Was this the most votes ever cast? Congrats to the winners. I am a customer of all three. Liam, can you post a link (or open up the thread) at the end of the forum thread? I was looking every day at the forum with no sign of update, till I found it here, accidentally! Congrats guys hope to see myself up there someday! Congratulations for all Providers and keep it UP!! They always had one. Look at VZ0 / 50ct / Iperweb. We do have one or more, however there is no stock, we only deploy those on demand of old and serious customers with a valid reason. Congratulations. Prometeus is always the best, Uncle Salvatore is Great ◕‿◕ . Congratulations to all the winner :) . And better luck next time to all those who missed it. Does Prometeus have other payment methods except of Paypal? For example, I am able to pay only by bank card, so what to do? We are investigating other means to pay, but will only work for iperweb ltd not for prometeus. Tried to buy the package from Ramnode following the direct signup link but found out the price is different? Can I get the price published in this article? Thank you. When you have configured ordering, go to the checkout page and the coupon ‘leb35’ will make the price the same as here. Thanks Liam & Nick A. I’ll place an order. happy to see ramnode here! 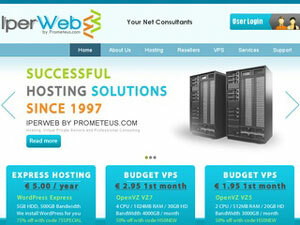 excellent service I havea 2 vps solid and fast like hell! Thanks! And thank you to everyone else! Awesome Job Everyone!! You guys deserve it! @Prometeus.net Please do not send our passwords in plaintext over email? Thanks. I don’t see any other way for you to receive your password for your VPS at this point. You are encouraged to change your password afterwards. Maybe not sending them at all is a credible option. Users can always ask for a password reset if they really cannot remember their password right after account creation. That’s something to consider. We’ve done that for user accounts already, but not VPS yet. Thanks for the suggestion. 1. When user is resetting the password, the system should only send a active link to reset the password through email. 2. Then user will click the link or etc.., and type the password directed into the system. Using this, the password never appear on any mail. Most of our mail is now being monitored or achieved (Even you deleted it immediately receive it). Sending password out in email should not be practised if possible. But if you change the password just after logging in, you achieve the same result. I meant the user account password. It is sent in plain text via email. I can understand the VPS SolusVM password being randomly generated and sent via email but the passwords for user accounts are chosen by users themselves. I certainly did not expect to see my chosen password again in plaintext via email. Congrats to all. :) To date I don’t have a LEB with any of the top providers for this quarter but probably will be picking up at least one soon. congrat to promoteus, buyvm and ramnode. Is it possible to provide a test IP for the Promoteus VPS so I can see latency from my location? Where is the final points table then? Good job all around guys! It’s nice to see consistency in satisfaction with two providers that are not new here combined with one that is relatively newer to LEB. If you do good work, people will notice. what a pitty BuyVM will move to Las Vegas.But the Prometeus is really good. It’s not much slower to Asia if it is any slower at all. Their Las Vegas location (Fiber Hub) is a lot better than San Jose especially with all the network issues they’ve been having. You can ping 64.125.0.4 to get a good idea of what kind of pings you’ll get from Asia to Vegas. I had a lot of people from mainland China reporting a 100ms+ drop in latency since the routes aren’t being buggered with anymore. Where are you based Halalkah? Clicked on the link above to purchase a € 37.5 /year | ($48~) Prometeus VPS and its coming up as 75 euro annually? Already running 3 VPS on Ramnode. Very good overall. Would love if Ramnode can come up with storage VPS? Eww slow I/O and RamNode does not mix! ;) Maybe someday. We don’t believe in the whole ‘no raid’ based storage that is becoming common. BuyVM – Home of the Lightning Fast Storage VPS! The AUP on prometeus/iperweb is almost impossible to find. I dont want to plunk down money if I dont know what im allowed and not allowed to do. Terms of service isnt an AUP. Acceptable use is in the section 3 of the mentioned pages. Buyvm is quiet good compare to it’s price. Raid10 + SSD will soon become VPS standard this year! Just want to testify that Prometeus is so damn awesome!! Words can’t describe how best is they are. I just with them in less then a month, but they treat me as I am already with them for ages. They are best on every specs!! The super fast server, the patiently fast response support, and the affordable price!! Whenever you read it just have a try on Prometeus and you will as the way I’m feeling. Keep up the great work Prometeus! Grazie! It is certainly disconcerting to see abusers and fakers all over, easy to forget those are just a small minority that gets in the light unwillingly, of course, but for every abuser there are tens and hundreds of satisfied customers. Do they have them once a year? No, offers come whenever we put up a lot of stock. We may have some SSD OVZ in a month or so. Right now, almost everything is sold out, unfortunately, but we still have some deals on my.iperweb.com site. https://my.iperweb.com/cart/low-end-vps Also have there customizable KVM and a few storage KVM leftovers. I’ve only had my Prometeus KVM5 VPS for a little over two weeks, but I’m quite satisfied so far. It’s absolutely the best value for the price, and pretty much anything goes, as long as it’s legal and doesn’t cause abuse complaints. They also own their own DC, which means they’re not reselling anything, avoiding middlemen. that raise prices. About the only legal things they don’t allow are TOR exit nodes/open proxies, as you have no control over what comes directly from the IP address of your VPS, and resource intensive game servers and p2p applications on a low-memory plan, as these can be flagged in the system as an abuse of resources. Only the biz plans have more strict limitations on the software you can run, but that’s because they greatly undercommit their resources on those nodes so that they can handle heavy load for business usage. Otherwise, they do allow IRC servers, game servers and even p2p applications on their non-biz plans, as long as you are distributing legal files. For more specific information, see this FAQ, which goes into even greater detail than the TOS. OH, and did I mention that the plan I have is a KVM-based VPS? This is definitely the best quality of service for the best price. Thanks, Prometeus, you guys rock! BuyVM and their services are down ATM. Hope they sort it out and be back soon. 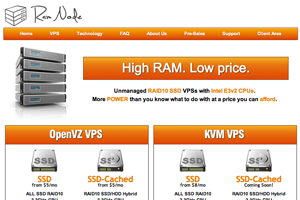 Picked up 2 VPS’s with RamNode. They seem to work great. Support is friendly and professional unlike another provider I was about to go with. Thanks Nick @ RamNode! @Francisco Please check ticket #129035. I won’t trust BuyVM any more. I’ll talk about my bad experience with BuyVM. I have two vps on BuyVM. One 256 KVM and it was due on 03/01/2013. The other one is 128 OVZ and it will be due on 12/29/2013. I receive several automatically sent mails from BuyVM, said my KVM plan will be due. Since I don’t want that VPS any more, I didn’t pay any attention to it. Today both my KVM plan and OVZ plan are suspended due to ‘late fee’. BuyVM just charge ‘late fee’ for the due invoice. I don’t pay the invoice because I don’t care. Why won’t you just terminate the KVM plan and keep my OVZ plan? I open a ticket and request to recover my OVZ plan. But the customer service says I have to pay for the ‘late fee’. Are you guys serious? Do I have to terminate manually for things I prepaid and don’t care any more? Do I have to suffer suspending for another prepaid plan due on end of this year? I’m the customer and I pay for a service. If I don’t want it any more, I won’t pay another invoice. I can’t understand why a late fee is generated and suspend my other plan. You can automatically send invoice mail, but can’t automatically terminate a due vps. Yes, BuyVM have a TOS. But I don’t have time to read it for just a file server for 15-25$. You guys can automatically charge me, you can’t automatically terminate the due service. Do evil for money, huh? Bad money is easy money for you! I have to tell everybody, BuyVM is BAD! I wanted to use BuyVM as a VPN. There was a popular blog post online with a script to set it up, specifically for BuyVM. I bought the 128MB plan (as directed) and ran the script and everything seemed to work. I could connect to the VPN on all my devices, but many sites just did not work. For example, reddit.com did not work but hulu.com did work. The plan I bought was quite cheap, and they stressed it had zero support with it. Also, the speed was very poor for some specific content that did work. Did BuyVM remove the features that allowed VPN service and not notify anyone? Did they block some sites? I don’t know, but I avoid BuyVM and OpenVZ altogether now. If you can’t access reddit.com, do a ping test. It may be a DNS problem. I use Google DNS and it works fine. Just wanted to warn you guys about BuyVM. I am not easily disappointed, especially when you consider the price, but think twice before purchasing their vps! I purchased one of their kvm vps in December, and it immediately got cancelled for no apparent reason. So I contacted their sales. Here is a transcript. I am Josh, and Val is the support staff. I can provide screenshots as well. Just pm me. I just purchased a kvm vps in the Las Vegas data center, but it has been canceled. Why? Why have I not been notified of the reason? Hello Josh. Please take the time to fully read our Terms of Service – once you have done so and can tell us why the order was declined, we’ll provide further instruction on how to proceed. I don’t know why the order was declined. This is my first order with you. I would think you should know why since you represent buyvm. Yes, I do know why. Once you have taken the time to read our policies, you will know this answer as well. Seriously, this is the most unhelpful support system I have ever encountered. I have read your TOS, and I still don’t know why. Now will you tell me or what? I’m getting impatient. If you don’t, I will have to report you to buyvm because they are paying you for nothing, since you don’t provide support. Your misunderstanding is unfortunate, but the reason we require you to tell us what policy you were in violation of is to ensure that you have actually taken the time to read said policies – this is SOP and asked of all persons that disregard our TOS upon signup. There’s nothing we can do about “being unhelpful” if you’re going to simply ignore the instructions we give. If you wish to “report me to buyvm” you are more than welcome to – such reports come to me anyways. I’ll be sure to have a word with myself about doing such a fine job remaining patient with users that seem to willfully disregard our rules. Again, we ask that you fully read our Terms of Service, and find the policy that you are neglecting. Once you’ve done so and we’re confident that you’re ready to abide by our conditions for retaining service with us, we’ll provide further instruction on how to proceed. As you can see, I wanted to abide by the TOS, and I read them, but I still could not tell why my vps had been cancelled. I think it is the job of the support team to provide support (duh!) and tell me why and what can be done about it. I have not tried their service yet, and frankly, I am afraid to do so since I obviously cannot rely on their support team when something goes wrong. This also shows that their team is not qualified. When I contacted Francisco, another of their staff, he also refused to acknowledge the unprofessional way their support team dealt with the problem. AGAIN, DO NOT BUY FROM THIS COMPANY! BUYVM SUPPORT IS RUBBISH, THEIR STAFF ARE NOT PROFESSIONAL!!! Most likely they are going to try and find excuses. But this is an honest review of their services, and I hope that you will see it for what it is, the truth.